No structured mechanism to report concerns/issues related to someone's travel. Lack of transparency in escalating issues which are not addressed in certain time/team. Status update on complaints raised and tracking process. We believe that we are in an industry which is getting organized and actual service is been provided by external/third parties and we are just facilitators. In above kind of business environments, issues/concerns related to customers are but natural. We love to have complaints on our site as we believe these are the real time feedback from customers which will enable us to improve our services in a much better way. Keeping the above concerns in view, our Team & Application is shaped in such a way that we encourage our esteemed & loved customers to raise complaints for free expression of their issues/views. Every complaint is assigned with a Ticket Number which not only captures the issue but also enables to have a real time update on ONE Click demand. Our dedicated QUALITY team not only enables the tracking of complaints but also carefully examines each & every complaint to address the same with greater speed, superior quality and to the best satisfaction of customers. We just don't end it here..if you still feel that your complaint is not addressed upto your expectations, our escalation PoCs (Point of Contacts ) are transparently exhibited for your immediate action. We consider Customer Complaints as integral part of our business and hence are far ahead of our Online Competitors who fail to do so. Passengers are able to reach us by using Customer Complaint Section. 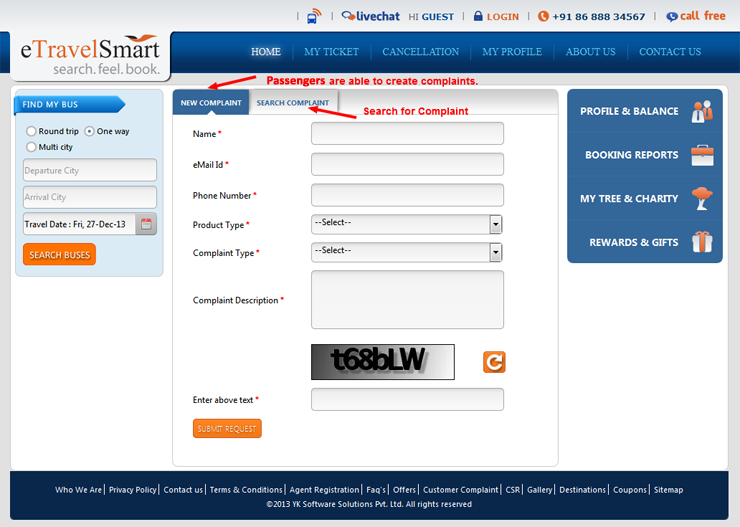 Simply enter all details to file a complaint and to get instant reply from eTravelSmart about your issue. For every complaint there will be an unique compliant number, where passengers are able to know status of their complaints simply by using search complaint.